After selecting the “Guided test” option from the home screen, the Test settings are shown. Each test group (e.g. GPS) can be selected or deselected for the test run. By default, all tests are run. 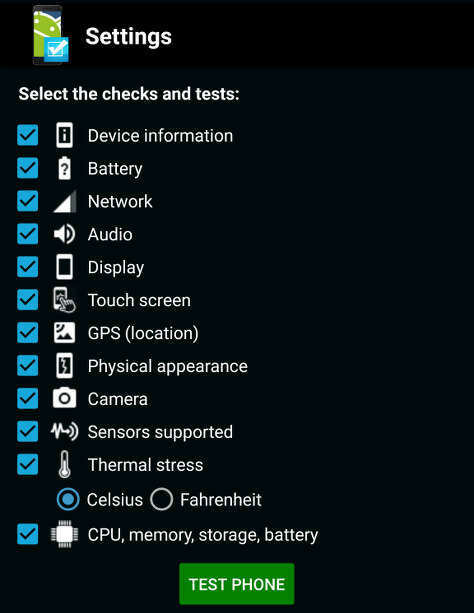 The phone checks and tests will occur in the order shown on the Settings screen above. The progress through the test process will be displayed in the title bar, e.g. [3 of 12]. It is should be noted that if you want to redo a test, you can just select the Android back button to go back to the previous test. The device is more than 30% charged and NOT connected to a charger during the test. Battery usage will be checked throughout the tests.